Every day, I hear the constant debate about whether the U.S. is going into a recession. If it does happen, it will be the most telegraphed recession in history. Interestingly, four states are already in a recession – Wyoming, South Dakota, Alaska and West Virginia. This is not surprising, as all of these states are highly exposed to energy in one form or another. Read More: Recession Already Reality in Spots. The pockets of recession make me think of Williston, North Dakota. Williston is ground zero for the fracking industry and the population was exploding until the bottom fell out of oil prices. It was such a phenomenon that several documentaries focused on the new boomtown and the dark side that its unprecedented growth had brought with it. Today, the town has an emptier feeling. Read more here about the decline from The New York Times. 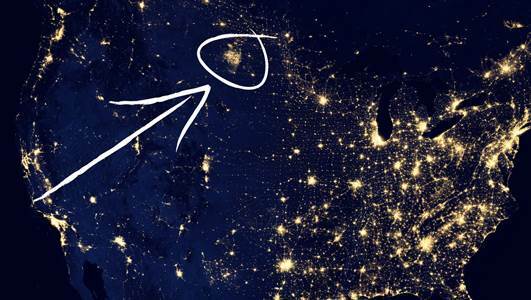 The image below illuminates how hot the North Dakota shale oil boom had become. This is a satellite image of the U.S. at nighttime in 2013. For the most part, this map makes a lot of sense; all of the major cities are bright spots and most of the west is dark. BUT…What is that huge city that is bigger than L.A. and Chicago in the middle of prairieland? It turns out that this is the light from the Bakken oil fields.